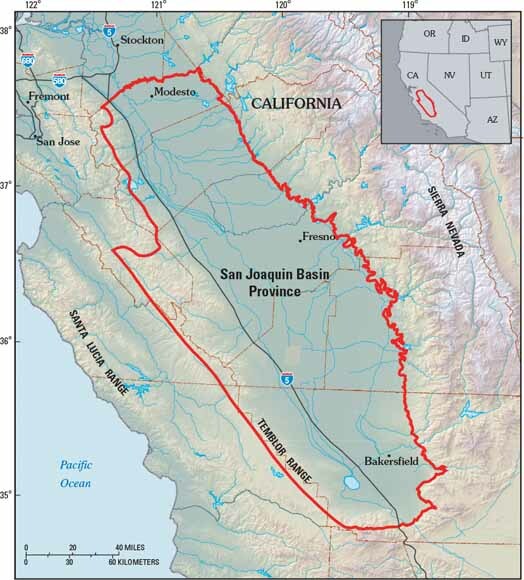 San Joaquin Basin Province (red outline) of California. County boundaries indicated by dashed brown lines (from figure 1). In 2003, the U.S. Geological Survey (USGS) completed an assessment of the oil and gas resource potential of the San Joaquin Basin Province of California. The assessment is based on the geologic elements of each Total Petroleum System defined in the province, including hydrocarbon source rocks (source-rock type and maturation and hydrocarbon generation and migration), reservoir rocks (sequence stratigraphy and petrophysical properties), and hydrocarbon traps (trap formation and timing). Using this geologic framework, the USGS defined five total petroleum systems and ten assessment units within these systems. Undiscovered oil and gas resources were quantitatively estimated for the ten assessment units. In addition, the potential was estimated for further growth of reserves in existing oil fields of the San Joaquin Basin. With respect to technically recoverable undiscovered conventional hydrocarbon resources in the San Joaquin Basin Province, the USGS estimated means of 1.8 trillion cubic feet of gas (TCFG), 393 million barrels of oil (MMBO), and 86 million barrels of total natural gas liquids (MMBNGL) for the five total petroleum systems (exclusive of reserve growth in existing oil fields). Well over half of both the mean undiscovered gas resource (61 percent, 1 TCFG) and the mean natural gas liquids resource (67 percent, or 57 MMBNGL) is in the Deep Fractured Pre-Monterey Assessment Unit of the Eocene-Miocene Composite Total Petroleum System (table 1.1). Of the mean 393 MMB of total undiscovered oil, about 332 MMBO (84 percent) is estimated to be in five assessment units of the Miocene Total Petroleum System, and 46 MMBO (12 percent) is estimated for the Eocene West Side Fold Belt Assessment Unit of the Eocene Composite Total Petroleum System (table 1.1). Nearly 31 percent, or 121 MMB, of the total mean undiscovered oil resource in the San Joaquin Basin Province is estimated to be in the Central Basin Monterey Diagenetic Traps Assessment Unit. On the basis of the analyses of recovery efficiencies and remaining oil-in-place, the USGS estimated that another 4,000 MMBO may be added to reserves in existing oil fields. A significant proportion of these reserves will come from improved recovery in diatomite reservoirs of the Monterey Formation. 1Donald L. Gautier (Task Leader), Allegra Hosford Scheirer, Marilyn E. Tennyson, Kenneth E. Peters, Leslie B. Magoon, Paul G. Lillis, Ronald R. Charpentier, Troy A. Cook, Christopher D. French, Timothy R. Klett, Richard M. Pollastro, and Christopher J. Schenk.